2: Investigating the trichomes. You are looking for milky white crystals with mushroom tops, with some of them beginning to turn to an amber color. It is extremely important to harvest at the right time. If your trichomes are still clear then you’ve got to wait. I know, I know, you want to get stoned NOW! But patience is a virtue young grasshopper. If you harvest too early you can reduce the potency of your marijuana significantly. If you harvest early your buds will have more of an “up” high, as the trichomes begin to turn white and amber the marijuana will be more dank, and couch lock. So, the best time for most people to harvest is when some of the trichomes are still clear (new trichomes will always be clear), with the rest being milky white and amber in equal proportions. This will ensure that your buds are just right. It will create a laid back high that isn’t too hyper. 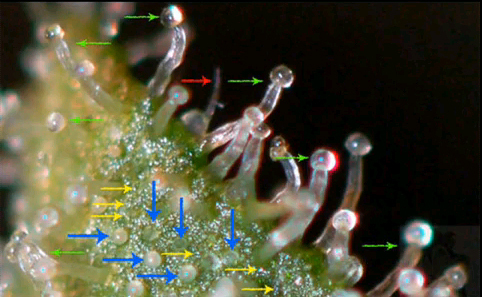 So how do you check the trichomes? There are various magnifying methods available. You could use one of those handy little pocket microscopes from Radio Shack, a jewelers loop, just a normal magnifying glass, or even take a picture of it on a high mega pixel camera, and then zoom into the image. Many times growers want to rush the last week. Don’t do it. 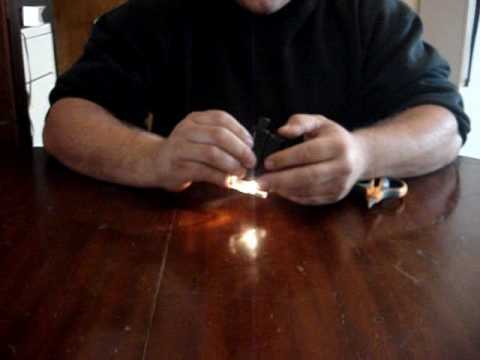 If you are really itching to smoke some of your plant you can cut off a small sample and dry it on a radiator (don’t put it in the microwave or oven, this will burn up your THC the same way a vaporizer does) . Another good plan is to flush your plants before harvest to get the last of the nutes out of the plant. This will help with the taste of the herb. What is flushing you ask? Basically all you have to do is fill a large bucket of water, let it sit for a day (this evaporates the chlorine present in tap water, and the heavier solids in the water will fall to the bottom.) Then PH your water and your going to totally inundate your flower pot with water. You can easily use up to 4 to 5 liters per plant to ensure you’re getting out all of those chemicals you’ve been feeding her in your fertilizer. Then, after you’ve flushed you’re going to wait until your soil is completely dry before harvest. The plant will look like it’s dying, and it is. The leaves will turn yellow and the stalks will begin to droop. In the plants mind it is mid fall (autumn) and she is preparing to die. So after your soil is dry, wait one more day (I know, all this waiting is killing you) and give it light for just one more day. Having a dry plant makes the curing process much easier. The worst thing imaginable is having a successful grow that’s been going on for nearly four months, and then you end up with bud rot. Bud rot forms because the space in which you’re drying is simply too humid. That’s why we want to get out all the excess water out of the plant before harvest. I’ve even heard of people who will let the plant sit and dry for a few days (with no light) after the peak has been reached. A great place to dry your weed is in the same space that you grew it. Especially if you have an exhaust fan (which you should, even for the smallest grow). You can set your timer on your fan (keep the light off! Light makes mold want to grow) to turn on like every other hour and this will blow out all the humid air. I’ll go more in depth as to how to properly cure your buds in a later post.